Welcome to Home Entertainment Direct. We are an independent, family run company, based in Cheshunt, Hertfordshire. We provide a professional installation service of all audio-visual equipment and technology in the home. Our specialist service covers installation of the latest range of digital, High Definition, 4K and 3D Plasma, LCD & LED TVs, Home Cinema, Projectors, ceiling speakers, Hi-Fi, Aerial/Satellite and multi-room Audio, Video, Cat5/Cat6 cabling networks. We provide distribution and integration of aerial, satellite, broadband, audio and HD video networks/services. We also supply a range of specialist AV cables, brackets and home cinema speakers/components. In addition to supply/installation services, we also provide consultancy and support solutions to assist customers with signal distribution, control and troubleshooting. We support all of the latest digital, UHD, 3D and networked products and technologies. Home Entertainment Direct has provided AV installation services for over 10 years including contract TV installation for customers of John Lewis Department Store, Welwyn Garden City. We personally install and supervise all aspects of installation, and do not sub-contract work back out to other companies/engineers. Please select a link from the menu to obtain more details of the services and products we provide. You can contact us to arrange a free no obligation quotation, or to discuss any AV enquiry. 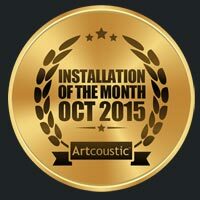 October’s Installation Of The Month is this beautiful project, installed by Home Entertainment Direct. Artcoustic 75-55 SL 8-4s are installed either side of the TV providing superb stereo sound quality. The TV is used for enjoying general TV, with a drop down screen coming down for movies and important sporting occasions. The system delivers superb picture and sounds, whilst working beautifully within the stunning interior design.